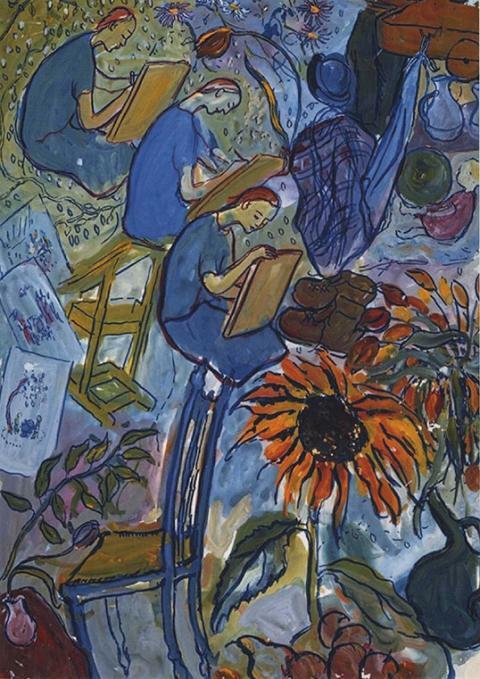 This exhibit features the work of German-Jewish artist Charlotte Salomon (1979-1943) who grew up as the daughter of a surgeon and a singer in Berlin. The Nazi takeover in 1933 changed the family's situation drastically and Charlotte Salomon escaped in 1939 to her grandparents, who had already sought refuge in Southern France. Hiding in Nice, Salomon created an unusual autobiography through more than 1,300 paintings that were created within 18 months between 1940 and 1942. Salomon decided to include 769 paintings in her work entitled Leben? oder Theater? In 1943, the Nazis deported her to Auschwitz, where she was murdered upon arrival. She was 26 years old. Before her arrest she gave her complete work to a friend, telling him, "Please keep this safe: C'est toute ma vie! This is my entire life!" This project is made possibility in part by the Goethe-Institut San Francisco, Center for the Study of Holocaust and Genocide, SSU Department of Modern Languages and LIterature, SSU German Club, Alliance for the Study of the Holocaust, and the University Library Associates.